The idea that the function of elected representatives in the legislative assembly should be to advance opinions, as distinct from interests, did not become at all prominent until the middle decades of the nineteenth century. Many of those who acted as early advocates of this idea took the view that the opinions to be advanced were the individual opinions of constituents, just as Bentham and James Mill had believed that representatives should be concerned with individual interests. This view clearly presents certain problems, for while a man’s interests are easy to recognize and relatively stable, his opinions tend to be personal, private and changeable, so that it is more difficult to know how they can be represented by someone else. Indeed, Jean-Jacques Rousseau took the view that this would be impossible, which was one of his reasons for not believing in the virtues of representative government. 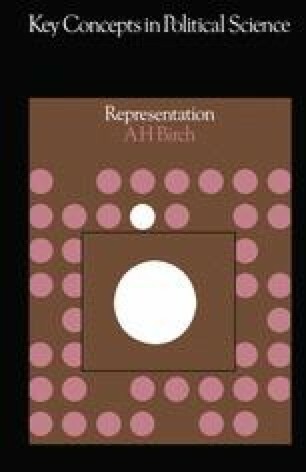 And even if this problem is not taken too seriously, it is clearly difficult to defend geographical constituencies in terms of a theory of representation which lays stress on the representation of personal opinions. It may be plausible (up to a point) to defend them by saying that the inhabitants of each town or rural community share certain interests but it is not very plausible to suggest that they are likely to have common views about such matters of opinion as censorship, capital punishment or the merits of the divorce laws.